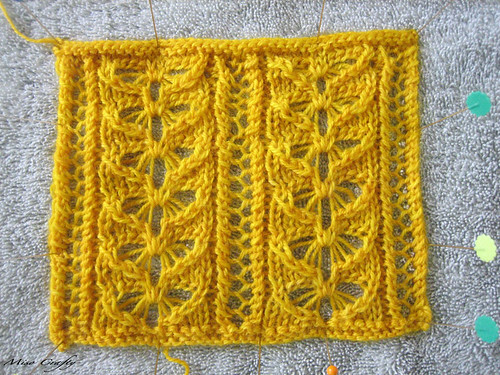 Miso Crafty Knits: Good Morning Sunshine! I was a bad girl last night. After coming home from knit night I quickly finished up a purple hat that I've been (slowly) working away on all week. Then I just as quickly whipped out some new yarn and started knitting up a swatch. I was so mesmerized and enthralled with this new pattern that I had completely forgotten that I had left a (finished!) project soaking away in the kitchen sink and was up way past my bedtime knitting up this swatch! As in 3am past my bedtime! I don't know if it's the pattern or the yarn, most likely both, that had me in a trance. All I know is that I rarely knit up a full size swatch for a project...or have thoroughly enjoyed knitting a swatch. Don't look too closely at the middle column. I know, I screwed up in a few spots! Can you guess what I'm going to start knitting up next?